Callaway Gardens, a resort about 60 miles south of Atlanta, markets itself as a place where families can enjoy quality time together while getting back to nature. That's all good, but its wholesome reputation had me slightly skeptical that the property's new TreeTop Adventure, a combination ropes course and zip line nestled high in the trees that opened in mid-May, would be, well, bland enough for Mom, Dad, Junior, and maybe even Grandma. So, just a few minutes into the experience, my inner adventure snob is more than impressed. Guides call these 24 aerial challenges, some of which are about 30 feet high, "games" – but then, so would Jason Bourne. For mere mortals, they're no joke: suspended logs, bridges, and even a series of more than a dozen narrow swings to navigate, one by one, the latter of which was so tricky for me I prayed mightily for the security of my safety clips and harness. Plus, there are no guides on the platforms, ready to catch you from the ziplines or offer hands-on help at tough spots. Instead, they shout guidance from the ground below – and, if you're moving too slow, good-naturedly blast a whistle at you. The ziplines themselves are actually the tamest part of the whole enchilada, and while you catch your breath and wipe off the sweat between challenges, gorgeous views of the serene wilderness, including nearby Mountain Creek Lake, stretch in all directions. Bottom line: The TreeTop Adventure is an all-around winner, and well worth the $30 price tag. Advance reservations are recommended, and you must be at least 54 inches tall and weigh less than 260 pounds. Group rates are also available. For more information, visit www.callawaygardens.com/treetop. Another new adventure offering in the South: the Adventure Trail Park at Beech Mountain, a popular ski destination in eastern North Carolina. On May 1, the park officially opened its Emerald Outback section, featuring more than eight miles of trails at elevations from 4,700 to 5,400 feet, which puts them among the highest on the East Coast. 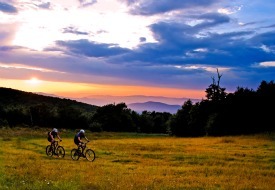 The trails offer a solid combo of single track, double track, and gravel traversing through a scenic backdrop of waterfalls, creeks, and panoramic views, all accessible from a trail head in the town of Beech Mountain. The Emerald Outback marks the first phase of the Beech Mountain Adventure Trail Park, which will grow to three phases encompassing 25 miles of trails. It was designed by mountain bikers, hikers, and trail runners and created almost entirely from volunteer labor. Trails are free and open to the public seven days a week. For more info, visit www.beechrecreation.org.